Do your kids get picky when eating their vegetables? 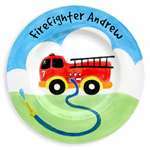 With our custom ceramic baby plates and personalized melamine plates for kids, you can now make dinner a fun and stress-free activity. 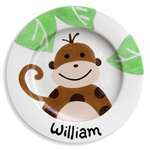 With these meal time kids’ plates, you can pick your favorite design in the color of your choice, choose the material you prefer (melamine or ceramic) and add your child’s name to make it truly theirs. 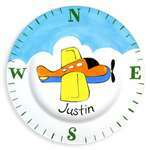 Our custom ceramic baby plates are 100% painted by hand, lead-free and safe to use for food. They come in two different sizes of 8” and 10.25” round. 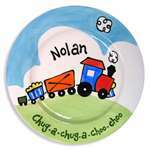 Our personalized melamine plates for kids are also hand painted, and come in 1 size, 10” round diameter. 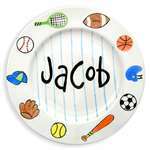 These personalized kid's plates are dishwasher safe but not good for microwave use. 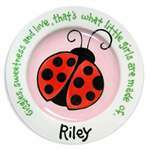 Custom made in USA, these plates are a must have in any family. 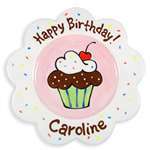 Be sure to browse our other selections of personalized children's plates such as Birthday Plates, Holiday Plates and Prayer Plates. 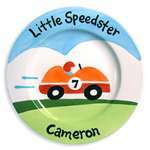 Tiny Keepsakes offers many other personalized kid’s products such as step stools, lunch boxes, growth charts, in addition to our personalized melamine plates for kids and custom ceramic baby plates. 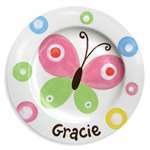 All our products are made from high quality materials and are designed with children in mind. If you can’t find what you are looking for, just make a toll-free call to 888.320.3080 or send us an email. Our customers are our #1 priority and we want to ensure you have best shopping experience. 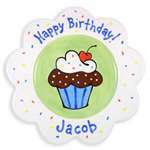 If you are placing your first order with us, use coupon code STEP and get 5% of your order. For exclusive discounts in the future, be sure to sign up for our loyalty program and like our Facebook page.